The hibernating season is over! The weather is getting warmer and once again it’s time to shed all those layers- not just the woolly ones but the ones that find a home around our middles in winter! All this thinking about layers inspired me to give the traditional stodgy lasagne a Spring makeover and instead of the usual pasta and meat tiers, I experimented with leaving out the meat and bechamel and reducing the amount of pasta. I used dried egg lasagne sheets as they are a store cupboard basic of mine and (almost) as good as fresh pasta. The changes to the traditional dish will probably upset all you purists out there as it’s not a typical lasagne any more! But on the plus side this is a lighter, lower calorie dish which is tasty, nutritional and less time-consuming to prepare. I used spinach as the meat substitute as it’s a fave veg of my daughter who happened to be helping me that day as chief cheese-grater. But you could use any other “meaty” vegetables like mushrooms or aubergines instead of spinach. If thoughts of squeezing into that bikini has brought you out in a cold sweat and you are on a ruthless calorie cutting mission, you can decrease the quantity of cheese topping. Full fat mozzarella for example adds around another 300 calories to the dish but it does add a lovely creamy texture. 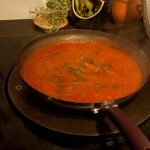 Prepare sauce by dicing then frying the leek, red pepper, halved cherry tomatoes and garlic until caramelised. Add spinach and add about 1/2 litre of vegetable stock to cover the spinach. Add salt, pepper and a little wine if preferred and cook gently for about 10 minutes. In the meantime lightly oil the oven proof dish and cover the bottom with pasta. Stir in pesto into the vegetable mixture before pouring it into the dish to covering the pasta. Reserve a little of the mixture. Cover the vegetable mixture with another layer of pasta sheets. Pour remaining sauce over it. 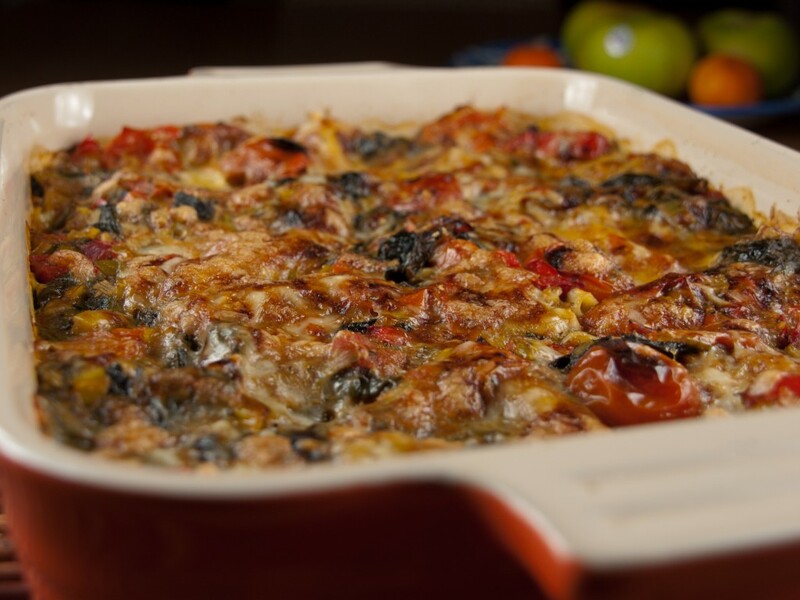 Cover with grated mozzarella and parmesan. Cook in a preheated oven for about twenty minutes (or following your fresh pasta cooking time)and until the cheese is golden brown. Hope you enjoy it! 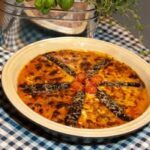 I’d love to hear your own suggestions for other low-calorie but healthy Mediterranean style fillings for this recipe. 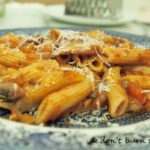 This entry was posted in All Recipes, Grains, Pulses & Pasta, Vegetarian and tagged cheese, family, Food blog, Mediterranean diet, mozzarella, parmesan, pasta, pesto, Recipe, spinach, tomatoes, vegetarian by dontburntheonions. Bookmark the permalink.